The Little Crooked Cottage : MR. PIG LIVE. . . with Ella and Penguin! MR. PIG LIVE. . . with Ella and Penguin! Hello, all you lovely readers out there. Welcome back to my award-winning daytime talk show. . .
Today's guests are friends of a feather. in light... and even... in the DARK! Please give a warm Crooked Cottage welcome to. . .
Ella and Penguin are the stars of Megan Maynor's debut picture book ELLA AND PENGUIN STICK TOGETHER, illustrated by Rosalinde Bonnet. Let's introduce ourselves, shall we? I'm your host, Mr. 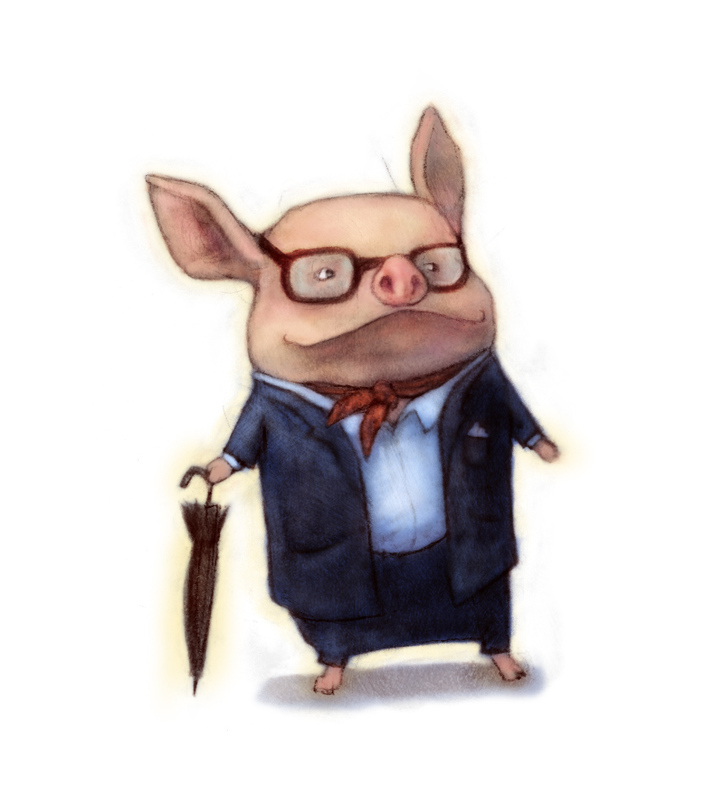 Pig. What are your full names? 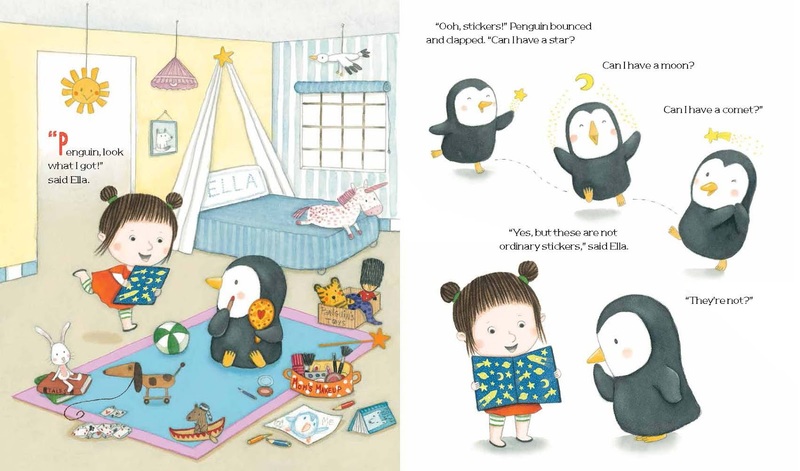 Penguin: This is my friend Ella. Ella: And this is my friend Penguin. Now onto more pressing questions: Do you have belly buttons? Penguin: *checks tummy* Ah! Oh no! Ella, I LOST my belly button! Ahhh! Where did it go?! Ahem, lets change the subject. What's the best thing about being you? Ella: Having Penguin for a friend. I do all the best things with Penguin. What's the worst thing about being you? Ella: I am not tall enough to reach all the things we need for our plans. Penguin: Sometimes Ella has to do things—gulp—without me. If you were stranded on a desert island, what would you bring? Penguin: Fish, fish crackers, gummy fish, and fish sticks. Ella: Dance with Penguin. Put on a show with Penguin. Build a fort with Penguin. Make a snack with Penguin. Sing with Penguin. Snuggle with Penguin. Penguin: Wake up. Play with Ella. Eat snacks. Take a bath for a hundred hours. Put on footie pajamas. Snuggle with Ella. 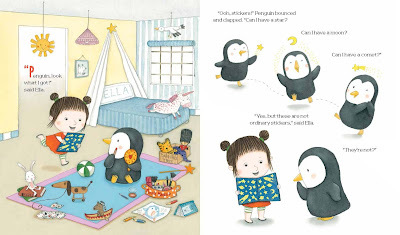 Penguin: I’m still learning, so Ella reads to me. What is you least favorite word? Ella: The kind of music that’s good for twirling and leaping. Penguin: The freezer door opening. Penguin: *sniff*. Oh, that’s so sad. *sniff* I hope I never hear that sound! Oh, boo hoo hoo! Share one thing that most of our readers don’t know about you. Penguin: I am an expert at rolling down hills. Ella: I’ve seen him. He’s very good. If you could dine with three characters from other books, who would they be? If a genie gave you one wish, what would you wish for? Ella: That kind of finger paint that has glitter in it. Penguin: Fish sticks. In a box that was never empty. Never-ending fish sticks. If you have a pocket, what is in it right now? Ella: A sticker, a stone, half a crayon, two candies, and some yarn. Penguin: Ah! I also lost my pocket! First my belly button, now my pocket?! Everything is lost! Oh boo hoo hoo! Ella: It’s okay, Penguin. I’ll share what’s in my pocket. Ella: My special recipe: Yogurt mixed with cereal. Penguin: Toast cut into the shape of a fish. Penguin: When I got my head stuck in a lampshade. Ella: When I called Penguin “Mom.” Remember that? Ella: People who think Penguin is cute. Ella: Oh no. You ARE cute. But you’re not JUST cute. Some people think you are only cute and not important. And you are EXTREMELY important. What was it like working with Megan Maynor? Ella: Exhausting. She had us go on SO MANY adventures before she settled on one for the book. Penguin: She still owes me some fish sticks. Fish sticks are delicious! Speaking of delicious, our caterer, Nina, from Mamabelly's Lunches with Love, has whipped up a delightful Literary Lunch for us today. Scroll down or click here, for a peek at her scrumptious creation! Megan Maynor is a former advertising copywriter and author of picture books ELLA AND PENGUIN STICK TOGETHER and ELLA AND PENGUIN: A PERFECT MATCH (coming 2017), both from HarperCollins Children’s Books. She lives in Minnesota with her husband and three children. 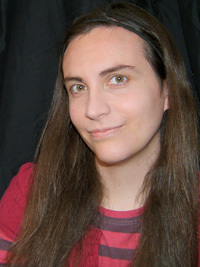 For more about Megan and her books, visit her website: http://www.meganmaynor.com. Rosalinde Bonnet loved to draw when she was little. She would often get into trouble in school because she doodled all over her notebooks during class. After high school, she studied at the Versailles School of Fine Arts for two years then at the École Nationale Supérieure des Arts Décoratifs in Paris for another four years. 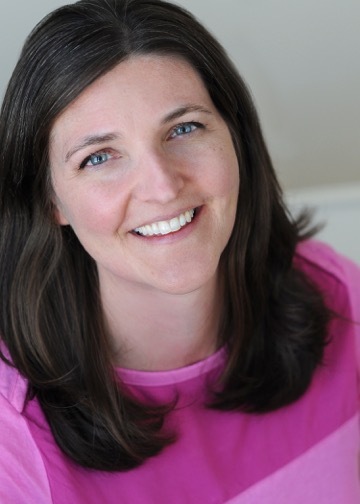 Since her graduation in 2004, she has written and/or illustrated numerous children's books published in France, in England and in the United States. Visit Rosalinde's website: http://www.rosalindebonnet.com to see more of her work! "Maynor, making her debut, backs up her perceptive premise with solid comic writing; even though Ella and Penguin’s search for a nonscary, semidark viewing environment proves unsuccessful, their attempts (which include sitting under a laundry basket and shielding the stickers from the light with frog- and bear-shaped umbrellas) have the authentic ring of kid ingenuity at work. 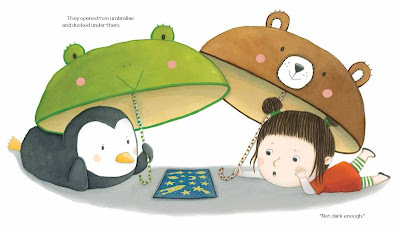 Working in watercolor and pencil, Bonnet (Poppy’s Perfect Paper) makes the repartee between the friends natural and appealing, and when Ella and Penguin finally screw their courage to the sticking place and enter the closet, the unleashed glowing is a payoff worth waiting for. " This interview had me laughing from start to finish! 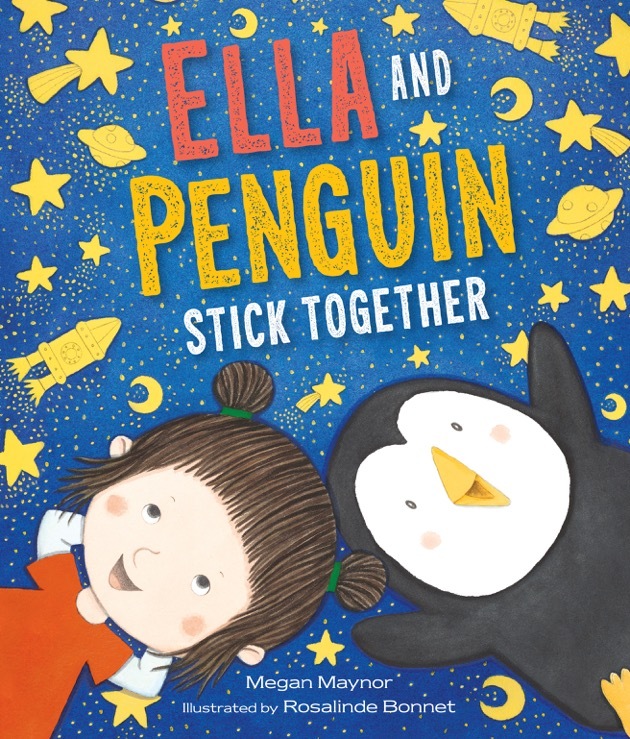 Well done Ella and Penguin! Hilarious and fun interview! Never ending fish sticks!